So bad it's good; so good it hurts. It's official. I'm canceling my Dead Space 3 and Aliens: Colonial Marines pre-orders. I have to use that money to buy two copies of Earth Defense Force 2025. A new trailer popped up today and it's one of the best damn things I've ever seen. Sure, it features some footage from earlier EDF 2025 videos, but there's some new bug stomping action mixed in as well. And this time it's in English. Kind of. I've watched this video about a half dozen times now. I don't ever want to not be watching it. It's like they put the original Japanese text and dialog through Google Translate, after getting Google Translate good and drunk. And not the fun kind of drunk, either. But enough about Google Translate's obnoxious drinking problem. Enjoy the video. All that just happened. Admit it. Your life is better. As amazing as this video is, it didn't even cover any of the sweet new vehicles or the badass new weapons! How can you contain yourself right now? You can't! Now these awesome images will be rattling around in your brain for the rest of the work day. It's both a blessing and a curse. You should thank me, and I'm sorry. 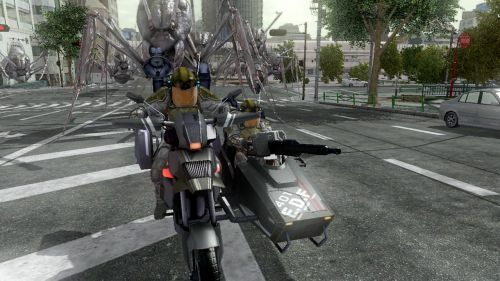 Earth Defense Force 2025 will support four player online co-op. It will be out later this year on the Xbox 360 and the PlayStation 3.